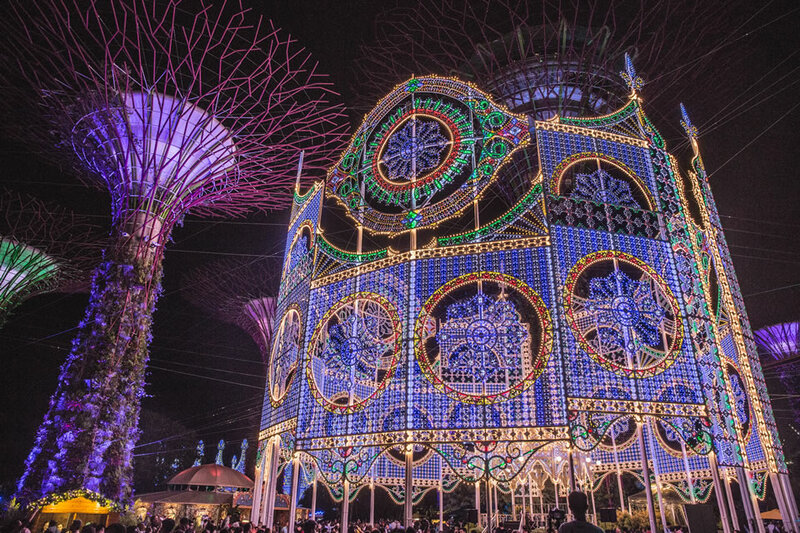 All You NEED To Know, CHRISTMAS WONDERLAND at Gardens By The Bay - SingaporeGO! Gardens by The Bay Best Price Tickets, Click here to purchase in APP. Be dazzled by magical luminarie lights that transform the fairground into a stunning wonderland, meet Father Christmas at Asia’s largest Santa’s Grotto, be mesmerised by the mind-blowing illusions of ‘2018 America’s Got Talent’ Rob Lake, experience ‘snow’ in the tropics, skate under the stars, have a go at the carnival games and rides, shop at the charming Festive Market and enjoy accessible gourmet cuisine at Slice of SAVOUR. Adding a whimsical touch of magic to the festivities is one of the world’s top illusionists, Rob Lake, who will headline the performance tent at Christmas Wonderland with his critically-acclaimed production, ‘The Magic of Rob Lake’. The America’s Got Talent 2018 quarterfinalist and youngest recipient of The Merlin Award internationally renowned for performing spectacular illusions guaranteed to delight audiences. Price not inclusive of Christmas Wonderland Admission ticket. Lace up and go Skating Under The Stars at the outdoor skating rink, specially flown in from Switzerland. This year’s rink is larger than ever and features a spectacular 8-metre tall illuminated Christmas tree nestled in the middle. This new bite-sized format of the SAVOUR Gourmet Festival concept focuses on accessible gourmet comfort food (from $6 onwards) curated by some of Singapore’s trendiest restaurants. Look forward to favourites from Saint Pierre by Emmanuel Stroobant, Italian cuisines ranging from the contemporary by Sinfonia to all-day cafe-bistro favourites by Bee’s Knees, innovative modern Chinese bites from Blue Lotus, juicy burgers from Three Buns, and artisanal Christmas cocktails exclusive to Christmas Wonderland by Three Wisemen. Brainchild of entrepreneur, highly acclaimed restaurateur, Owner and Managing Director Ricky Ng, Blue Lotus Chinese Eating House has been synonymous with one of the island’s best chilli crab dishes and innovative modern Chinese menus around town. As the undisputed pioneer of New Age Chinese cuisine, Ng continues to push culinary boundaries by experimenting with myriad flavours and artfully blending these with what today’s discerning diners look for in a meal, adding his unique contemporary spins on traditional and popular dishes to create iconic Blue Lotus dishes. Bee’s Knees draws inspiration from the highly social, evolved behaviour of bees. Located on the ground level of The Garage, Bee’s Knees is a fun, laidback, and family-friendly all-day-dining garden café and bistro by day and casual hangout spot by night. With breakfast, croissant, pizzas, salads, sandwiches, pastas, waffles, pancakes and beer options, Bee’s Knees aims to pollinate the Gardens with warm hospitality, sincere, and genuine service. ‘Bee social,’ ‘bee connected’ is the friendly promise here. Three Wisemen is a spirited and aspiring team of Mixologists who specialise in artisan beverages like cocktails and mocktails. We always believe in and strive for a collaborative approach with our creative and adaptive squad to provide bespoke and experience driven services to celebrate your life with ounces. Three Wisemen is here to celebrate life with you! An intimate semi-acoustic performance series staged under the romantic lights of the Cassa Armonica – nestled at the heart of Christmas Wonderland’s Festive Markets. Be delighted by the festive sounds of some of Singapore’s finest talents. Rani Singam is one of the most sought-after and accomplished contemporary vocalists today. She has been named in “The Jazz Singers, The Ultimate Guide”, a Hal Leonard publication which serves as an encyclopedic guide on the important singers in jazz. Guitarist Andrew Lim has been an integral part of the jazz scene in Singapore and abroad since 2001. During that time he has participated in recordings and numerous concert and club performances with musicians from all generations. But as much as Sobs’ songs shimmer with pop immediacy, sombre undertones cloud the buoyant tunes. Frontwoman Celine Autumn’s voice is at once both pastel and haunting as she reminisces on desires and dreams with affecting frankness, drawing comparisons to the likes of Alvvays & Frankie Cosmos. In this juxtaposition, the band finds itself walking a fine line between the ebullience of high-spirited indie rock and the tense anxiety of restless melancholia. They burst onto the Singapore music scene in May 2014, when their spontaneous performance on the MRT train went viral on social media. Joanna Dong is a Singaporean jazz vocalist, musical theatre actress and TV host. Over the years, the versatile singer has established herself as one of the most talented and sought-after jazz vocalists in Singapore, with a repertoire that spans a wide range of audiences. A graduate with an Honours Degree in Sociology from the National University of Singapore, Joanna is strongly bilingual and very passionate about sharing her love for jazz with Mandarin speaking audiences. Sara Wee is a sought-after vocalist and guitarist with 15 years of experience performing with her band 53A at established local spots. Joie’s foray into the scene started in 2008 with her covers on YouTube. Her vocal-heavy takes on popular songs were met with tremendously positive reception, and her audience started to swell. Orchestra Collective is Singapore’s finest independent wind band. This dynamic and innovative musical initiative driven by young musicians with strong honest beliefs in music aims to deliver high quality concert experiences. Formed in 2012 and two-time champions of the Singapore International Band Festival in 2012 and 2018, the collective has gone on to feature in various gala concerts and performances at Singapore’s major concert venues. Get ahead with your Christmas shopping or enjoy the festive atmosphere around a European-style Christmas Market! Weave your way around the Supertree Grove, where the charming Festive Market will feature a collection of 24 specially designed wooden huts adapted from renowned Christmas markets throughout Europe, such as those in Hyde Park in London and the Avenue des Champs-Élysées in Paris. Shop for one-of-a-kind Christmas gifts such as handmade crafts, boutique goods and vintage finds, or indulge in tasty treats and specialty food and beverages. If you have a poor sense of directions, I have prepared a map for you, Just in case !!! Feels like Christmas is already around the corner, Can’t wait for the all the good food, fun activities!!! Who is with me? Share this to your love ones. Spread the love, Spread the festive mood!!! Click here to get your discounted tickets!! Tsum Tsum is coming to town!! !